Crew size will vary according to mission. Can also potentially be retrofitted to carry anti-shipping air-to-surface missiles. 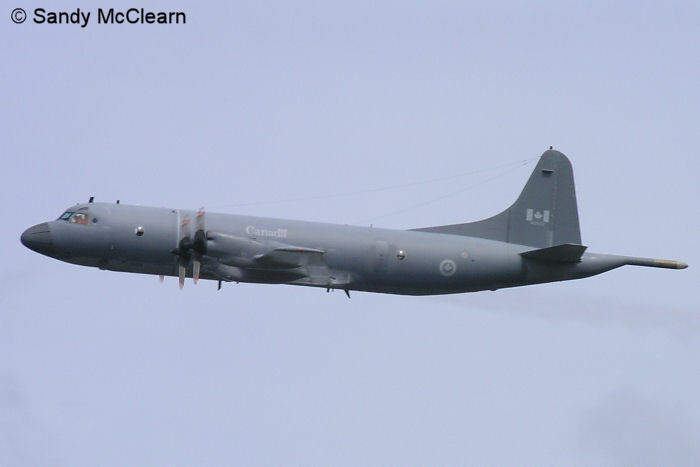 Information from Canadian Air Force web site. 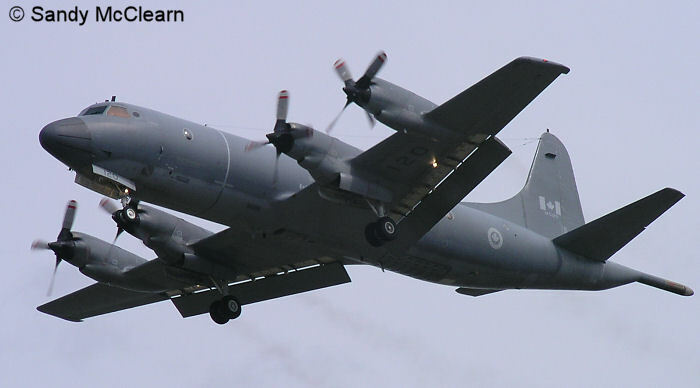 The CP-140 Aurora came into service in 1980, to replace the aging Argus. 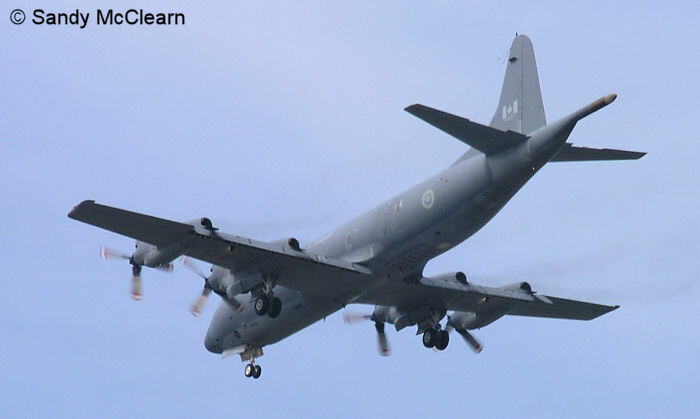 Using the old Lockheed Electra airframe with new turboprop engines, and based on the USN's P-3 Orion maritime patrol aircraft, the Aurora was fitted with the more advanced anti-submarine sensors from the USN's Viking carrier borne ASW aircraft. The name, Aurora, was taken from the name of the Goddess that restored Orion's eyesight. 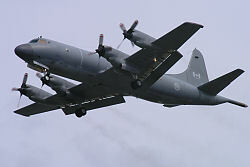 In 1991, the last three Orion airframes were bought off the assembly line in California and were pressed into service as the CP140A Arcturus aircraft; sporting a very similar airframe, these three planes do not have the ASW sensors found in the Aurora, and are used primarily for pilot training and sovereignty patrols. It is difficult to visually tell the difference betwen the two types of aircraft, as the Arcturus retains the MAD boom, although it is empty. Auroras have operated extensively within Canada, and have also operated in support of Operation Apollo in the Persian Gulf and Northern Arabian Sea since 2001. This reduced flight hours on the airframes of the more capable Aurora. 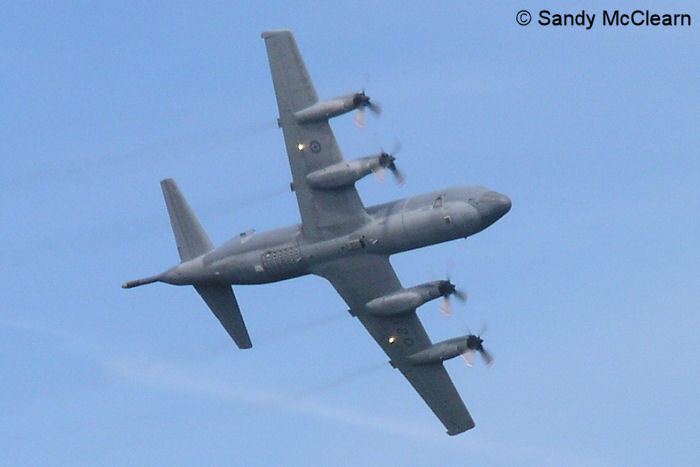 Currently (2005), the Aurora aircraft are undergoing extensive upgrades to extend their lifetimes, while the Arcturus will eventually be retired. 1. Flap and landing gear down, an Aurora approaches for a landing. Sandy McClearn photo. 3. The underside of an Aurora, with sonobuoy tubes and torpedo bay doors visible. Sandy McClearn photo. Copyright © 1997-2005, Sandy McClearn. All Rights Reserved.